On the Water at Stout’s Island Lodge! It’s that time of year where kids live in the water as parents either join them or watch from the quiet shade of their beach umbrella! Our Wisconsin Lake resorts are the perfect getaway for families looking to get out on the water! Hydro-biking offers a fun and continuous workout while casually riding along the shore. You can use the hydro-bikes by the water toy docks on the main island, and our Wisconsin Lake resorts staff will be happy to help you with any questions or concerns on how to use any of our equipment. We do advise you steer clear from weedy-areas, like under the bridge, as the propellers may get stuck! 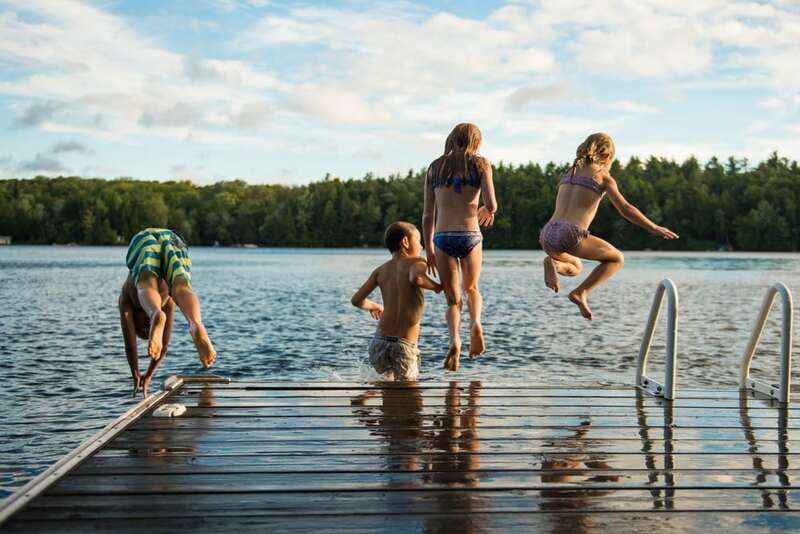 Our Wisconsin Lake resorts’ swimming dock is on the south lawn, and this is a swimmers’ only area as the shallow waters make it suitable for all ages! For your safety, please make sure you stay in designed swim spaces and make sure that children are supervised at all time when they are near the water. Our experienced and licensed fishing guide Steve Sedani will happily take you on a fishing excursion on nearby lakes. Red Cedar Lake offers a variety of fish such as Walleye, Northern Pike, Bluegill, Largemouth and Smallmouth Bass. Because of the lake’s many structures, holes, islands, and varied underwater habitat, fish hide everywhere, making it a thrilling chase. Drifting with live bait helps narrow down the active areas, to find that sweet spot! If you forgot to pack your fishing pole, our Wisconsin Lake resorts have you covered! However, you will need to get your own bait and fishing license! However, our staff will be happy to help you carry any gear or assist you to the best of their ability. Join us at our Wisconsin Lake resorts for some splashing fun on the water! Relaxing Stay at our luxurious resort in Wisconsin!